Manjula Padmanabhan straddles several worlds. A playwright, novelist, short story writer and illustrator, she won the Onassis Prize for Theatre in Greece for her play Harvest (2003), which was made into an award-winning film, Deham, by Govind Nihalani. Be it her plays, cartoons or novels, Padmanabhan has endeavoured to take a slice of life, turn it around its head, paint it with streaks of her imagination and present it to the reader, who is thrown unawares into the distinct, sinister swirl of narrative. Born in 1953 in Delhi, Padmanabhan spent her teenage years in India in the late 1960s. Her early life was spent in Europe and Southeast Asia. She has created a popular comic strip character called Suki, which made its appearance in the Sunday Observer and The Pioneer in the ’80s and the ’90s. Her other works include Getting There, Hot Death Cold Soup, Kleptomania and Three Virgins and Other Stories. She has also written and illustrated a few children's books. Padmanabhan's latest work of fiction, The Island of Lost Girls (Hachette India), builds up in the foreground of the plot of her previous novel Escape. Written as a sequel to Escape, the new novel delves deeper into the dark nether world of a futuristic Dystopia. It follows the journey of Youngest from the periphery of a forgotten world into the seemingly mainstream way of life. Youngest's journey is both a physical and personal one, in which he is undergoing a transformation on the physical, mental, emotional and spiritual planes while actually being transported from the world he knows to the world he can barely fathom. His agreement with the General, who denotes the brute masculine force of dictatorship and appalling effects of scientific intervention, is a pact made with the Devil, which binds him to an incomprehensible life. He has to change his gender to serve the General's sexual desires, get a voice chip installed in his mouth that continuously echoes the General's instructions in his head and is bound to him by a tracker. Youngest's mission is to take Meiji to "the island of lost girls". It's a place dominated by women where broken girls are put together again by re-initiating them into the society, erasing their memories and enabling them to be more independent. There is more depth to the activities on the island, which the reader discovers as the narrative progresses. Before he gets to the island, Youngest has to navigate the Zone where he encounters Aila, another transgender, who becomes his partner in compassion. It is interesting to note how Padmanabhan has woven in human emotions into a scenario that is distinctly futuristic and dystopian. When human values have been degraded beyond redemption, when humans themselves as an entity are endangered in the face of clones and drones, it is the inherent humane qualities that keep the world afloat. Apart from creating complex characters that are likeable or not, as per the role they play, Padmanabhan has also designed a multi-dimensional living world that holds important imagery, which gives a glimpse into the life of the living beings inhabiting it. For instance, the organic underwater units that house the women are the creation of a genius imagination. Language is another point that sparks off discussion. The use of Pidgin English is quite rampant in the novel, thereby highlighting the distorted fabric of the futuristic society. In Escape, the central character is Meiji whose story is a unique one, given the socio-ecological squalor of her world. She is the only surviving female in a land where women have been annihilated. With the process of reproduction replicated with genetic science, women have been made redundant by the ruling class of dictatorial clones, referred to as Generals. Meiji is protected by her three uncles — Eldest, Middle and Youngest. They decide to take her to the edge of the known world, over to a place where women are supposed to be healed. It falls on Youngest to undertake this journey. The journey is fully explored in the new novel, where Youngest is the central figure. The character of Meiji around whom most of the action revolves is an instance of a life catapulted into a vortex of subversion, perversion and distortion. The island, which is supposed to help the girls heal themselves, is a dangerous place where the girls are at the risk of losing their identities to emerge as entities designed by the wardens. Meiji grapples with the truth of her present life while trying to reconstruct her past and is able to come to take control of her life. Her peculiar gender role adds to the complexity of her situation. Padmanabhan follows a fairly linear narrative and introduces the characters at crucial junctures in the story. To put it in her words, "events (in the novel) proceed in sequence, as with any quest-narrative". While the key characters are well-developed, the minor characters are limited to the roles they play. The plot of the novel unfolds over the 360 odd pages and the author does well not to meander in sub-plots and complex storylines. For your new novel, you choose to create a futuristic dystopia. Which current conditions contributed to the features of this dystopia? For all practical purposes, we are in the grip of World War III. What most people around the globe are experiencing right now is a dystopia, in the present. My novel is only mildly fictional and futuristic — much of what happens in it is within the realm of possibility. The characters are un-Indian in all their aspects. Why this deliberate move away from Indianness? I don't know about "deliberate". In a sense, I wasn't attempting to make any kind of statements about nations or nationality. The story takes place in a world where existing national boundaries have been dissolved. What kind of social commentary are you making through the novel, especially in terms of the women in the novel? In my view, an author makes a statement through his/her work, not through commentaries outside of the work. So, if I were to answer this, it would subvert the point of writing the novel. I would encourage the reader to explore the book through the prism of his or her own experiences as a gendered being; to see whether I have offered insights that may be of interest. The highlight of the new world is the moral degradation of the social fabric, with transgenders playing an important role. Comment. Yes, the book deals with a world in which the fabric of society has broken down in crucial ways. The characters struggle within a chaotic anything-goes situation. In many ways, the moral compass is set by each character's personal needs and desires. Which was the most easy and most difficult character to portray in The Island of Lost Girls? I would prefer to say which my favourite character was: by far and away, Youngest. I don't really discriminate between characters while writing about them — if they have a role to play, they all get equal attention — they are not like separate parts of a machine that must be crafted individually and then screwed into place. Each element flows alongside and into all others. In the novel, you have played with the English language by using pidgin. It is important to understand all the way through the book that the characters belong to different ethnicities, different histories and geographies. Language is always a huge problem in such stories. In this particular book, my choice was to use pidgin as a way of signalling differences between the characters on the page and the way that the reader responds to them. Why did you choose a third person narrative for the novel? Third person narrators are what I prefer. Using the first person (usually) limits an author's ability to report on story elements that cannot be known to a single narrator. I didn't want to complicate an already very complex situation by introducing multiple first-person viewpoints. I wanted to keep it as simple as possible given the difficulties involving (for instance) men inhabiting women's bodies and different levels of consciousness within these differently-gendered states. The plot of the novel is concerned about the plight of women and emergence of a new Dark Age. How did you manage to retain human elements like compassion and love amidst this futuristic chaos? Well, by maintaining a very simple, in a sense, single line of intention: Youngest's love for his child. It's like the single pure light that cuts through all the cruelty, aggression and confusion. 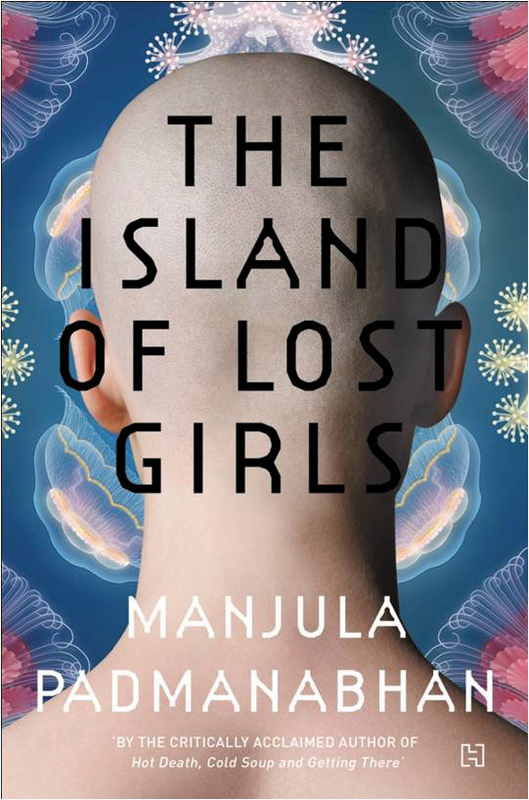 Which dystopian novel has been a source of inspiration for The Island of Lost Girls? You will not like this answer! But it's the truth — my entire inspiration was my own novel, Escape. It is the prequel to this book. What kind of narrative technique are you most comfortable with? I write short stories, plays and novels. My comic strip Suki sometimes included brief stories, but so far I have not written graphic novels/stories. Modern plays in English by Indian playwrights form a niche segment. What prompted you to foray into plays? The first play I wrote, (it was called Lights Out, written in 1984) was based on a first-person account given to me by a friend who witnessed a woman being gang-raped. I wrote about it as a play because that seemed to be the best medium for the subject. It was only subsequent to Lights Out that I thought of further ideas for plays. How does your thought process change as an illustrator and a novelist? I am often asked this! But it's not in any way mysterious or unusual. It's just the same way that one switches from the camera to e-mail while using a smartphone — different parts of the same machine. What made you take up fiction? How were your childhood and young adult days influenced by literature? Both my parents were graduates. They and my two elder sisters were all avid readers and our house was filled with books. We got stacks of daily newspapers and had several magazine subscriptions. We went to the movies often, listened to all the pop music we could manage and my father in particular loved comic strips and political cartoons. So, you know, through very many channels. What is your perception of contemporary Indian fiction in English, especially by women writers? Who are your favourite writers amongst your contemporaries? Amongst Indians, my favourite authors include Kiran Nagarkar, I. Allan Sealy and Altaf Tyrewala, but there are very many fine authors whose works I have not gotten around to because I avoid reading when I am working on one of my own books, and I took almost five years to write The Island of Lost Girls. This has resulted in a kind of book-drought for me. India is witnessing a trend of metro reads and chick-lit, which is being taken in by young readers. Comment. The huge volume of published authors is impressive, but over all, the quality of writing has deteriorated. It's a world-wide phenomenon. Do you have any ambition or aim as a novelist? I think, my primary goal as a novelist is just to be able to continue publishing the sort of stories/books I like to write — complex, somewhat dark novels about ideas rather than easy-to-read crowd-pleasers. If you had a choice to be born in any other age as an Indian author which era would you choose and why? NOW is surely the most favourable time for being an Indian woman writer! So far as I know, it has never been easier to get published and to reach out to a large audience. The main reason for this is e-books, the Internet and the existence of self-publishing. Of course, there are lots of problems associated with this situation. For instance, many self-published authors face marketing problems and there's a chronic shortage of good editors. Still: all of this is against the backdrop of extremely limited opportunities in the past.